In my meal plan this week, I had Tomato Basil Soup for Sunday’s dinner, and man was it good! Below I’ll give you my version of it. I changed a few things around to make it more affordable and tastier for me. ** This freezes well, and is great with any kind of bread, or just grilled cheese sandwiches! Here is my version. The picture was taken right before I put the leftovers in refrigerator. Sautee onions and garlic in olive oil (about 1T) until soft. Add crushed tomatoes and chicken broth. Bring to boil, then reduce heat and simmer for about 10 minutes. Add basil, reduce heat to low; stir in cream and butter. Cook until butter is melted. This sounds wonderful. I have a similar recipe with potatoes in it (you put it through the blender when done cooking) and it doesn’t call for that much butter. Let me know if you want the recipe- it makes probably 12 cups! Thank you. 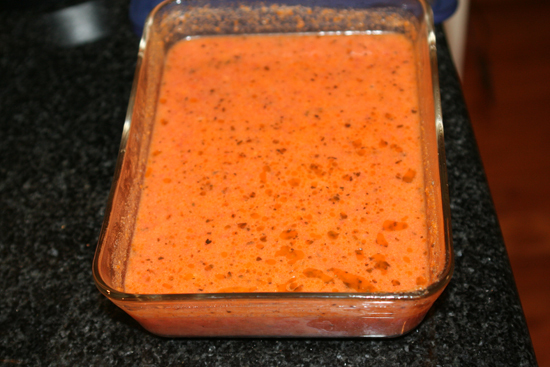 My husband loves the tomato basil soup at Panera and I have been wanting to try a recipe. I have made this soup a couple of times and love it! I didn’t have whole milk or cream so I used 1/2 c. evaporated milk and 1/2 c. skim milk-it turned out great! Tomato Basil Soup One of my favs!